Swiped directly from Authentic Haven Brand’s website. I have been asked a lot of questions about manure tea and why I insist upon using it. Doesn’t it smell? Don’t you compost? Really you are going to pour sh*& on your garden and then eat the food from it? I don’t have a lot of brand loyalty, I will admit, I am usually more concerned about the kind of deal I am getting. However, there are a few exceptions to this rule. Authentic Haven Brand is one of those exceptions. Aside from the fact that the owner of the company has become a close personal friend over the last few years via twitter, skype and phone calls, I trust something that works. Composted manure is one of the best sources of nitrogen for the soil. Sure you can use some basic commercial fertilizer (10-10-10) and add what you need to the soil but do you know where it comes from? Nope, neither do I. I also refuse to purchase anything that may in anyway be associated with Monsanto or other big ag companies. I probably do still buy things from time to time unknowingly. All other moral issues aside I know that this composted manure comes from a closed system. The animals creating it are on an organic diet and the manure is handled all right there on the ranch. From the photos I have seen it is a gorgeous ranch which I hope to make it to the opposite coast and visit one day. Composted manure from a closed system means that there is very limited chance of any other chemicals coming into contact with the end product. It has been dried and aged so that there is none of the fresh cow pie odor. 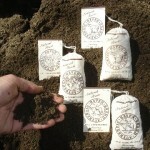 It comes in cloth tea bags and each bag will make 5 gallons of liquid fertilizer. It is safe to use on outdoor plants as well as indoor. You can still eat the produce fresh off the vine even when using it, a good rain washes it from the fruit. Aged/composted means that any possible e. coli or other contaminants causing recalls in commercial grocery stores are no longer present. This weekend as part of an attempt to grow my fan page for Sustainable Education Initiative, I am going to order an extra bag or two of the good stuff to give away. I had wanted to reach 100 fans by yesterday but figured what the heck, I will set up the video camera, a hat and snag a child to pull a name out. I will video tape the name being drawn and post it here and on the page. The winner will receive a bag to try out on their garden. If you get a chance look up Annie Haven on Twitter she is an awesome lady with invaluable gardening knowledge. I know it! Love you Annie!